It’s January 2019. 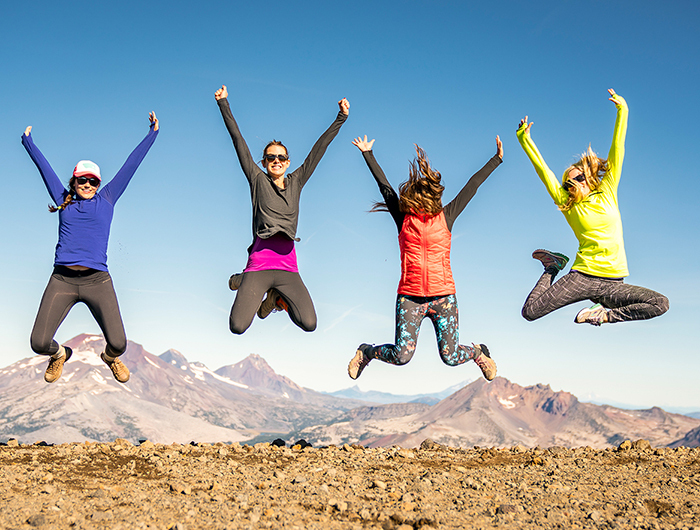 Time to visit the gym once or twice before losing interest, make resolutions we’ll forget about by March, and of course, look forward to a year’s worth of amazing events in Bend. It’s possible not all of those things apply to you, just like it’s possible your favorite Bend events for 2019 might be different from mine. Get ready for Mt. Bachelor Pridefest in January. But since I’m the one dorkishly smiling in the photo attached to this blog, allow me to gush about the Bend events that make me super-giddy in 2019. I’m marking this down for January, though it technically spans January 31 through February 3. I’m talking about the second annual Mt. 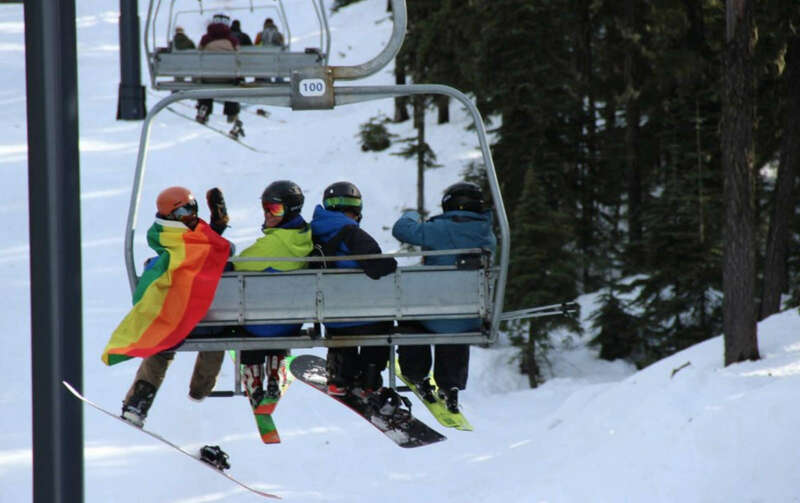 Bachelor Pridefest, and I’m tickled to bits by this full weekend of LGBTQ-centric events including organized groups for Alpine and Nordic skiing, Drag Tubing, an on-mountain Apres Ski Celebration, and so much more. Check out their website for discounts on lodging and airfare, as well as a roundup of activities for the whole weekend. Then scroll through the gallery of images and if you’re not grinning by the time you reach the bottom, you might be dead inside. The shortest month just happens to include some of my favorite events of the year in Bend. 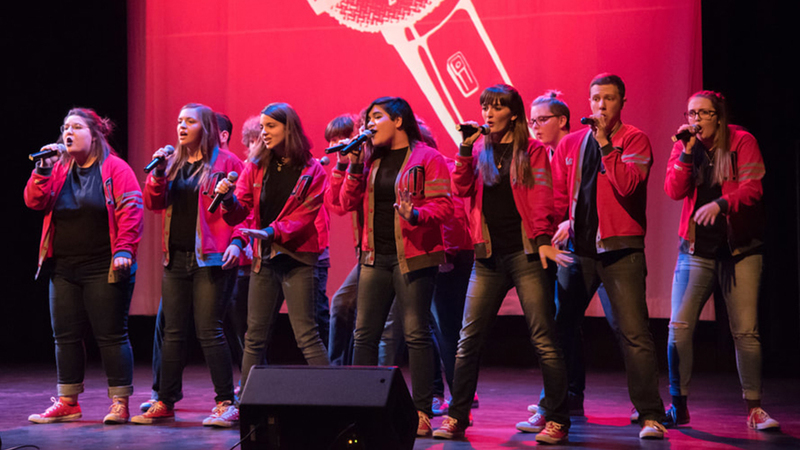 Bend A Cappella Fest is one of the highlights of February. President’s Weekend boasts the renowned Oregon Winterfest, complete with live music, rail jam, and competitions ranging from fire pits to ice sculptures. One of my all-time favorite events is Zwickelmania, the statewide celebration of Oregon’s craft breweries. While Portland breweries are celebrating one week earlier, breweries around Central Oregon are marking the occasion on Saturday, February 23 with brewery tours, samples, prizes, and much more. I’m also giddy about the Bend A Cappella Fest taking place February 7-9. This tends to sell out, so grab tickets early if you want your a capella fix. March means spring break for many families, and the joyful occurrence is heralded in by my favorite spring blooms wiggling their way out of the dirt. Bend Women’s March is a month-long celebration of women. Beyond the natural attractions, March is marked in Bend by a month-long celebration known as Bend Women’s March. No, it’s not the sort of march that involves women taking to the street with picket signs. It’s more about taking to the hiking trails with a big ol’ grin on your face because you’ve spent the weekend basking in an array of cultural events and urban adventures focused on females. The pinnacle event is Muse Conference, which brings together internationally-recognized artists, authors, athletes, entrepreneurs, activists, and social change leaders to kick of International Women’s Month. This year’s event takes place Feb. 28-March 3, so scope out the schedule of events and plan your Bend Women’s March itinerary online now. April’s First Friday Art Walk is a great time to emerge from hibernation. Ahh, this is when it really starts to feel like spring in Bend. 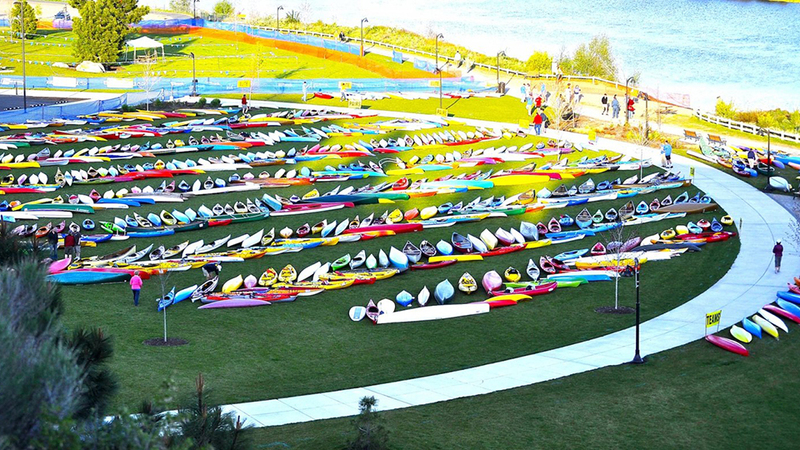 The Pole Pedal Paddle is a spectacle worth witnessing in May, whether you’re competing or watching. The multi-sport Pole Pedal Paddle event ushers in the season whether you’re participating or just watching. It’s happening May 18 this year, and you’ll want to book early if you plan to be in town. Snow enthusiasts will be thrilled to know there’s still a full month of spring skiing at Mt. Bachelor, which usually stays open through Memorial Day Weekend. Unless we’re lucky enough to snag a Memorial Weekend show at the Les Schwab Amphitheater, June is usually when concert season kicks into full swing. Right now (January through April) is when you want to keep your eyes on their Facebook page for show announcements, and pounce early on shows where tickets are likely to sell out. Summer concert season at the Les Schwab Amphitheater kicks into high gear each June. Beyond the concerts, June is the month where we start seeing other outdoorsy events like the Bite of Bend. Even if you can’t make that, book yourself an outdoor table at one of the Bend restaurants with outdoor seating and bask in the sunshiny assurance that summer has arrived! 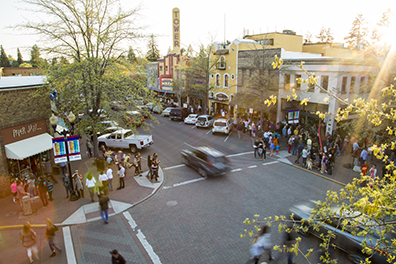 This is one of the busiest months in Bend, and if you’re not a fan of crowds, you might want to plan your visit for a different time. 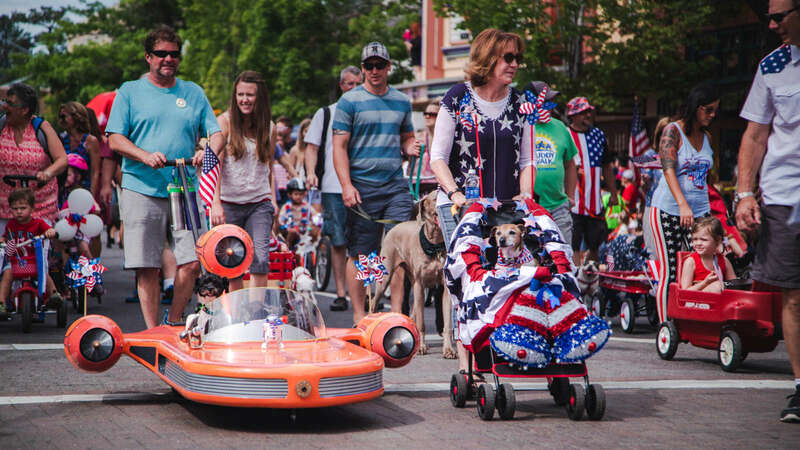 The July 4 Pet Parade is one of Bend’s most cherished summer events. For those who do Visit Bend in July, there’s something happening nearly every day of the week. My personal faves are the Old Fashioned 4th of July Festival and its flagship event, the Bend Pet Parade. Outdoor concerts abound with Munch and Music and the regular lineup at the Les Schwab Amphitheater. There’s also the annual Balloons Over Bend event, which is terrific fun for families. This is also a primo month for whitewater rafting, floating the river, kayaking, canoeing, SUPing, and more. Go here for ideas on all manner of summer fun. 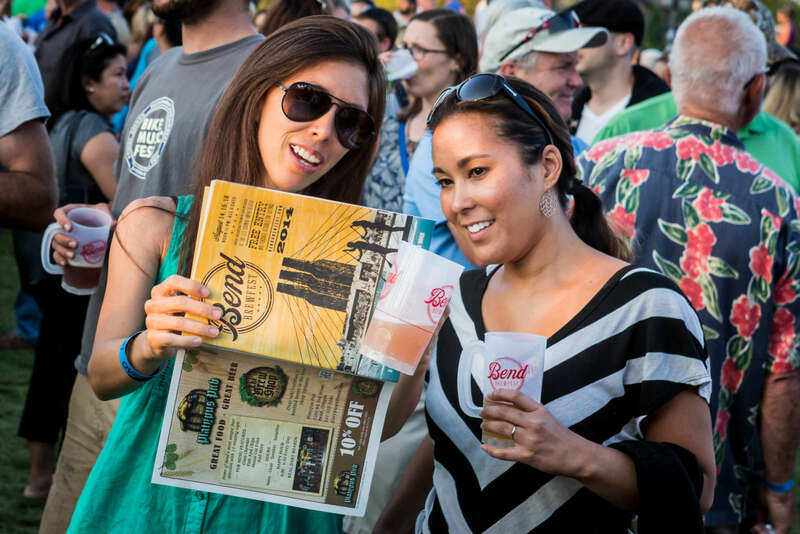 Cheers to Bend Brewfest in August! It’s my birthday month, so is there really anything more important to highlight? Okay, there’s also the Bend Brewfest, which is a three-day extravaganza celebrating craft beer. You’ll typically see around 80 breweries each pouring a couple beers, plus some cideries and wineries. Saturday is by far the busiest day, so opt for an afternoon stop on Thursday or Friday if you like things a little more mellow. My birthday offers a primo excuse for outdoor dining and the super-unique experience of riding a Mt. Bachelor chairlift to your sunset dinner spot at 7,800-feet above sea level. And here we are at my favorite month of the year in Bend. The weather is milder, the crowds are smaller, the kids are back in school, and we’re all celebrating my wedding anniversary. 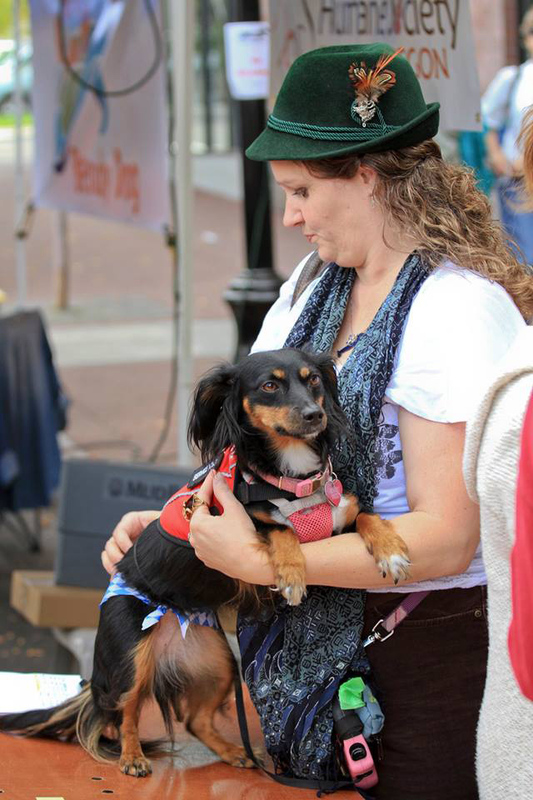 Don’t miss the famous weiner dog races when Oktoberfest rolls around in September. You are celebrating it, right? One of the best ways to get festive is with the Little Woody Barrel-Aged Beer, Cider, and Whiskey Festival (say that five times fast). That’s happening Labor Day weekend, or you could do your beer-fueled celebrating a bit later in the month with Oktoberfest in Downtown Bend September 20-21 (and if you’re getting ready to ask me why Oktoberfest happens in September, go here). This is also a terrific month to cross off some of that hiking you put off during the summer months when it was too hot or crowded. Bend’s first snowfall of the season could happen anytime between October and November, so snow dancers start watching the skies this time of year. Opening day for skating season at The Pavilion generally happens in October. October is a great month scoping out the dramatic fall colors in spots like Drake Park and Shevlin Park. You can enjoy all of those things if you show up for one of the Tenth Month events, including the BendFilm Festival, Bend Venture Conferences, or the Swivel Digital Conference. My favorite October activity is the Historical Haunts Tour sponsored by the Deschutes Historical Museum, which is a guided walking tour of Downtown Bend filled with lots of spooky stories. 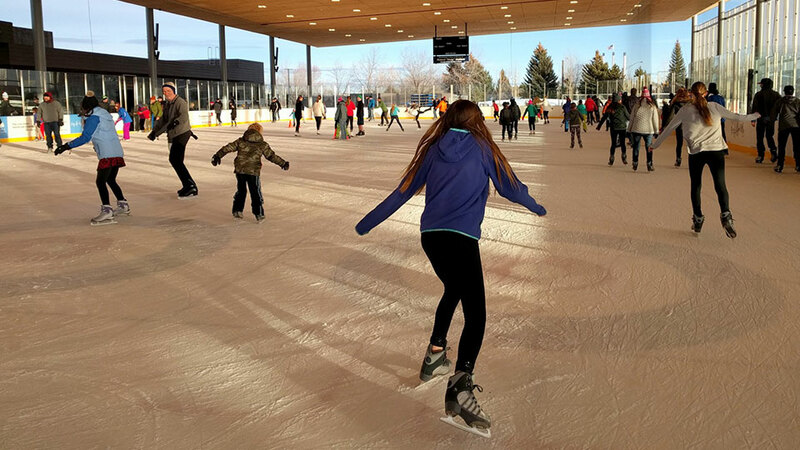 October also marks the start of ice season at The Pavilion (Central Oregon’s only NHL-sized ice rink). There’s also the Bend Fall Festival to round out the festive aspect of the month. Once upon a time, November was the slowest month for tourism in Bend. This baby could be yours if you hit the Bend Ale Trail in November. 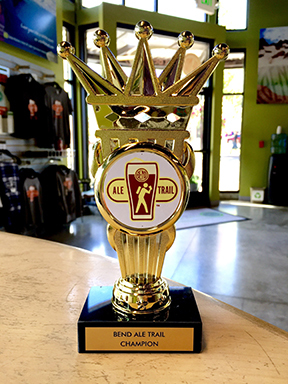 That’s changed in recent years as Bend Ale Trail Month has brought a whole lot of beer aficionados to town on a quest for the trophy that’s awarded to those who turn in a completed Bend Ale Trail passport in November. Mt. Bachelor’s opening day usually happens just after Thanksgiving, so that’s another big milestone in November. After that, you have the start of holiday festivities in the Old Mill District with carriage rides, caroling, and Santa arriving via helicopter. The lovely Christmas tree in Drake Park near Downtown Bend. 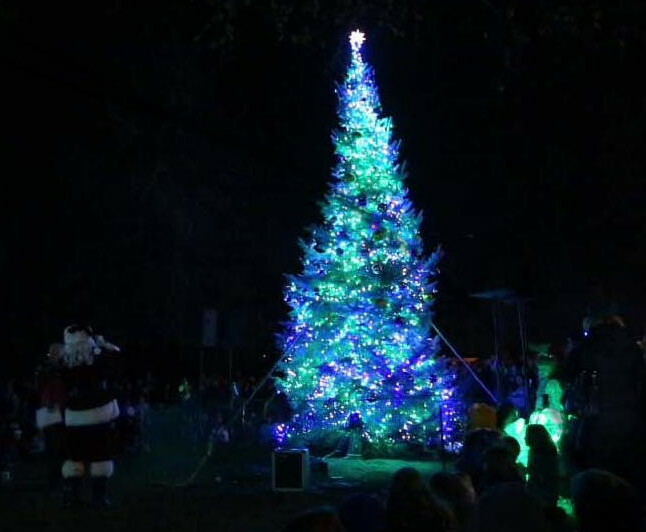 There’s also the annual Christmas Tree Lighting in Downtown Bend, along with the Christmas Parade (yep, I know neither of those links goes right to the 2019 event at the moment, but expect them to be updated later in the year). This is also a month when the Tower Theatre trots out some of their coolest shows, ranging from holiday concerts to screenings of popular Christmas movies. So that does it for my roundup of the Bend events and activities I’m most excited about in 2019? What’s on your list?